Invertebrates can be a great addition to community marine aquariums and can provide you with something different to watch. For lovers of variety, hermit crabs are best of all, because their appearance (and some of their behaviour) will change as they choose different shells to protect their growing bodies. They also make lively, intelligent pets capable of recognising and getting to know their owners. Hermit crabs love to play and will do best if provided with a stimulating environment. Wooden and plastic toys will encourage them to have fun and they also engage in social activity, doing best in groups of three or more, though they are individuals so there's always a risk of personality clashes. If properly cared for, they are long-lived, and they can be a great help to you in cleaning and maintaining the aquarium environment. The down side of keeping hermit crabs is that they can be rather delicate, and they're not always in great shape when you buy them, but with proper care and attention there's no reason why they shouldn't prosper. Hermit crabs need an environment with plenty of nooks and crannies to explore and hide in - they're perfectly suited to living on reefs. Because of their use of shells they are generally able to defend themselves from predators, but they have vulnerable periods, especially when moulting, and they should not be kept with aggressive fish. Bear in mind that they grow continually. Look up the maximum size of the species you intend to buy and make sure you can accommodate it properly. Naturally, one of the things you'll have to do with your hermit crab is to supply it with shells. Always make sure it has a choice as it will suffer from stress if forced to settle for something inappropriate, making it more vulnerable to illness. Shells should be of an appropriate size and they can be various in shape, though you should avoid painted ones, which can be poisonous. Adventurous individual hermit crabs are sometimes willing to use interesting wooden or plastic substitutes instead of real shells, which can make them quite a talking point! Every now and again they'll shed their exoskeletons; leave these in the aquarium so they can eat them and recover their lost calcium. Most hermit crabs thrive in water between 24ºC and 29ºC. They need very clean water as they are susceptible to bacterial and fungal diseases. Since they can't be treated with standard copper-based medicines you'll need to make sure you have appropriate remedies to hand. Hermit crabs are not fussy eaters. They will happily eat algae, helping to keep your aquarium clean, and they enjoy algae discs and pellets. Smaller crustaceans and shrimp are a good choice because these will boost their calcium levels, making it easier for them to develop their exoskeletons. Some individuals will nibble at calceous rocks if you have these in your tank. 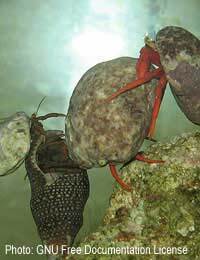 Hermit crabs have difficulty competing in aquarium environments where floating food is quickly snapped up by fish. Make sure enough material reaches the bottom to sustain them. Dwarf blue, yellow and red tip hermit crabs - So named for their brightly coloured, stripy forelegs, these are among the smallest hermit crabs available, making them ideal for busy reefs with peaceful fish. Scarlet reef hermit crabs - These small red and yellow crustaceans need a sandy substrate and should have plenty of algae or seaweed to eat in order to stay in prime condition. Left handed hermit crabs - These striking creatures have huge left claws and you may sometime see the males sparring with them. They're particularly good at cleaning up aquarium waste. Halloween hermit crabs - With vivid stripes of red and orange, these sociable crabs are great algae eaters and like to burrow through sand. Electric orange hermit crabs - These crustaceans have bright orange bodies and bright blue eyes. They are among the easier species to care for. When you keep hermit crabs, you'll find that you're always discovering new things about them. Although they need a lot of attention and care, they'll give you a great deal in return, and you'll find few aquatic pets as much fun to spend time with. Re: Why do my Fish Keep Dying? Re: Should I Keep My Aquarium Lights On? @1KoolCid1 - sounds like it is being attacked. I'd separate them. Is it ok to put a tiny adult fish in with a baby fish? Can 3 female platies, 5 female neon tetras, and a nerite snail live together as tank mates in a 10 gallon take and all be safe?